Raising kids in Sonoma has tons of benefits, beautiful weather, picturesque pastures and amazing local produce. The food part of this joyous trinity seemed to disappear when I started feeding my 6 month old premade babyfood. Have you ever tasted store bought babyfood? The other day, I opened a jar of garden veggie dinner of the organic variety. I gave some to CJ, my 6 month old. He spit it out! So, I had to wonder why his protest? I tasted it. It was absolutely dreadful. I spit it out too! It made me wonder about the long term effect of serving my child bland disgusting mush. So, in a very dramatic style, I tossed the jar in the trash and threw some of my dinner into a blender (the magic bullet – best 20$ investment ever). Shallot and lavender chicken, sautéed Romano beans and panko crusted mac n’cheese. Interestingly enough, CJ gobbled down the blended mush. It turns out that folks have written all about this phenomena – check out Hungry Monkey by Matthew Amster-Burton and Bringing Up Bebe by Pamela Druckerman. It has turned into a bit of an experiment for me. As I fed my first son completely differently than how I am feeding CJ. With Bobby, I followed the traditional approach. First he had rice cereal. Then I slowly introduced each food individually for about a 5 day period looking for allergies. For awhile Bobby had very plain tastes that have taken awhile to undo. That’s not to say I disagree with the idea of slowly introducing foods as to look for allergies. But as a mom with a child with food allergies, I can tell you that in my experience the reaction a child may have to food can be really pronounced (rash, wheezing, swelling, vomit). It is quite possible that I stunted Bobby’s culinary tastes by feeding him such plain food for so long. Having come to this realization, I have completely changed what and how I feed CJ. Now for breakfast, he gets whatever we’re having. Today it was bits of sweet potato banana scones (see recipe in my blog post). For lunch, he gets blended fruits and veggies. He snacks on fresh produce from the farmers market. He loves cucumbers, peaches and plums all fed through a mesh feeder. For dinner, he gets a mashed version of whatever we’re having. Over the weekend, he tasted and loved ribeye steak, basa fillets, and lavender chicken. All were hits as he didn’t spit it out and wanted more. Don’t get me wrong – sometimes he gets jarred food too as it is so convenient. It is the rare instance that I don’t add some sort of flavoring to it. So, if you want to start feeding your baby Sonoma foodie style – pick up a small blender like the Magic Bullet and a few mesh feeders. Get creative and you won’t be disappointed. 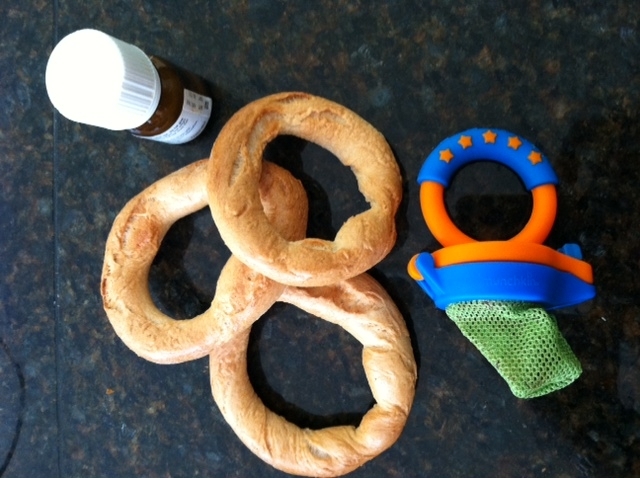 This entry was posted in eagle mom, food, infant, sonoma, tips, Uncategorized and tagged babyfood, children, cultivating baby's tastes, feeding infants, sonoma, tips on August 9, 2012 by Modern Mama. “A happy baby is a healthy baby.” That’s what the lady at Homegrown Bagels, in Sonoma told me as she handed me a bag of bagels specifically designed for teething babies. As I took the bag, I wondered whether the little bagels would help make my CJ happy again. They say that three months is the perfect age. For awhile I wondered about the source of such comments, then it hit me – three months is when babies start to become more aware. They start to notice and interact with the world around them. They smile, coo and giggle. Who doesn’t like a three month old baby? Then four months hits and the same once smiling, cooing and giggling baby, has bouts of crying and screaming. In addition, they start drooling enough to make some dogs jealous. The cause? Teeth. Those pesky teeth cause a ton of pain as they work their way into the scene. And, in the process, they turn the sweet baby into a fussy one. It’s happened to my own little CJ recently. With moments when he’s totally inconsolable, waking up from a dead sleep with a screech unlike any other cry, CJ has been in major pain. I even trekked him to the big city (Petaluma) for his doctor to take a peek, and well, the route of his pain – teething. Having tried nearly all of these recommendations, it goes without saying that CJ is one of two things. He is either much more comfortable or more entertained by the various things I am offering him. He loves chewing on frozen bananas in mesh feeders, gnawing on bagels and sucking on washcloths. Sometimes though I do think that he has more fun playing the “mommy pick it up” game. The game goes like this – I give him the bagel, he drops it on the floor, I pick it up and so on and so forth. Even if the happiness is caused by the game CJ and I play with teething tools, it is happiness just the same. It rings true that a happy baby is a healthy baby. Thank you to the moms and dads out there who gave me new ideas (and Homegrown Bagels for the teething bagels). This entry was posted in infant, sonoma, teething, tips, Uncategorized and tagged infants, teething, tips on July 16, 2012 by Modern Mama.